We took a road trip to Montana to get away for a week. Little did we know what we would encounter while on our trip. 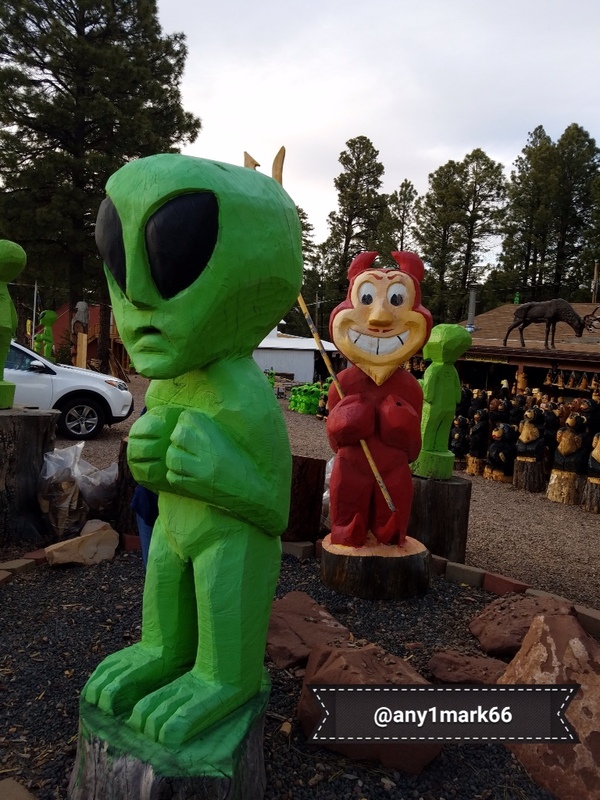 We came across a roadside business where they make different characters from logs. Such wonderful wood carvings! But there was one carving that really caught my eye. It was a carving of an alien. “Several years ago we had an UFO land about a mile from here. Several people were able to get photos. When the aliens saw the lights of the cameras go off they got into their spaceship and took off. Thank you Mark for our photo prompt this week! 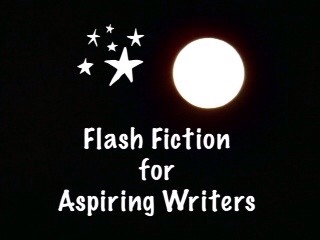 This is my 175 word story for the flash fiction challenge, Flash Fiction for Aspiring Writers. We are given a photo prompt and approximately 75-175 words with which to create our stories. It's fun and everyone is invited to participate. For more information, click HERE. Wow! that was such a wonderful story, PJ. That’s a good question Iain! How funny to think that one of the aliens’ extraterrestrial powers is to keep your photos from developing — that would explain a lot! Fun story, PJ. Hahaha! Yes, so true. They don’t want their existence known. Oh really? That is interesting!! It was closed but my wife and I walked around to check out all that was there. There was a bear treeing a lumberjack carving that was bigger than our Toyota RAV4! Oh my gosh really!? That is BIG! I would loved to have seen it. I would have to stop too. Little green men, I love it! That alien looks cold Priceless 🙂 And I enjoyed your story (I always do!). Yes, they do look cold! Haha! Thank you so much Colleen! Great story Joy, it almost sounds true..
LOL! It really does almost sound true. But, as far as I know, it isn’t! Haha! Thank you Michael! Drats Joy you could have started a new rumour….I hear there are some strange things happen in Montana. Haha! I could have started a new rumor! In fact, I should have! Yes, a lot of strange things happen in Montana. My cousin lives there. Hahaha! Hahaha! That would be perfect! That was an awesome story, you did heaps with the photo prompt ! Darn those camera-proof aliens. Good job there was a talented sculptor on hand! Yes, there was a talented sculpture – a wood carver! Hahaha! You are so right Paul! I bet they do too! Thank you for reading! True or not, the story worked wonders in putting that little town on the map. Stories like this could almost be true and people love to check them out. The clever (crafty) sculptor was certainly doing his bit to keep the story alive. – and make a nice lot of money while he was at it. A great story, PJ. That is so true! It could possibly happen that way! You’re right that it brings all kinds of possibilities to think about. Haha! That is so true. Thank you so much! The myth that w ill live on for generations of vacation goers! Great story, PJ! Thank you so much Ellespeth! Very neat History you’ve created here. At least it’s good business for the town from the tourists. I live about 400 miles from Roswell. I have never seen a UFO nor have I been to any UFO museum in Roswell although I have been to Roswell. When I went through Roswell, NM I don’t think there were any UFO sightings. I think those happened after that. I lived about 100 miles from Roswell for the first 12 years of my life.